We are close to the 300th review of SuperPhillip Central! Let's do a new but short review. The game itself is short but at five dollars, you get what you pay for. It's Fun! Fun! Minigolf TOUCH! for 3DSWare. Let's see just how "Fun! Fun!" the game truly is. Back on the tail end of 2008, the small German team Shin'en developed and released Fun! Fun! 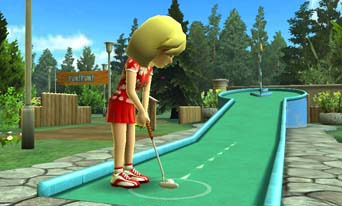 Minigolf to mediocre reviews and middling sales despite the game's incredible visuals for a WiiWare title. Nearly four years later, Shin'en strikes back and returns to the tee with Fun! Fun! Minigolf TOUCH! on the 3DS system's eShop. Unfortunately, the team misfires their shot once again and hits it out-of-bounds. 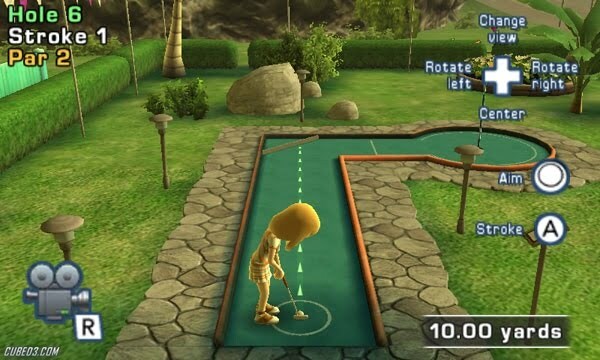 Starting off with Shin'en's newest downloadable game, you choose from one of three save slots, create a custom golfer from a disappointingly small sample of shirts, pants, and shoes, and you are then whisked off to to main menu. Here you can enter Cup mode where you play through a 9-hole affair in America, the first and only cup unlocked at the beginning of the game. As you earn coins from sinking putts, you can go to the Shop which houses a profusion of products to purchase such as the ability to play as a Mii character (totally disturbing), the opportunity to try out the Asian and European 9-hole courses, the chance to try out the Trick Shot courses, and aesthetic changes like new putters and sound effects for the game. Despite saying that the game has 81 holes, the majority of them are just the same starting 27 holes remixed with new and different obstacles and hazard placement. The American Cup is the easiest of the three main courses with the European Cup housing the hardest holes. creepy would be an understatement. Fun! Fun! Minigolf TOUCH! can either be played with touch controls or with the Circle Pad and buttons. I found that trying to aim with the touch screen (performed by touching an outer circle to point your ball where you hope to shoot it) made for an effort in frustration. It is next to impossible to get the line of where the ball will be hit to a satisfactory place as the moving speed is so swift. The Circle Pad is your best bet, allowing greater precision and slower movement. Whether you use touch or a button, a strength gauge (as seen in most arcade golf games) measures how hard you plan on hitting the golf ball. A small white dot then sways from left to right over your ball with the goal being to press the button when the dot is directly on top to hit the golf ball perfectly straight. The analog controls work well enough for the game. I would advise against using the touch screen as it is not always 100% effective. By far the most annoying feature of Fun! Fun! 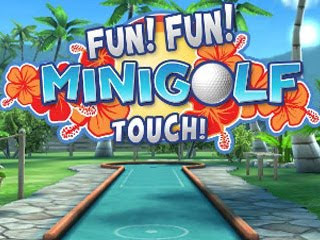 Minigolf TOUCH!-- and one that plagued the original WiiWare game-- is the out-of-bounds rule. The game has an area on each hole that is designated as in-bounds, so if your ball winds up anywhere outside this zone, your ball is out-of-bounds and you must start again at the tee. This means that if your shot is not perfect, you will be forced to shoot from the tee over and over... and over... and over (and over). This is not how minigolf works. Maybe in Germany this is how people play it (I sincerely doubt that), but all it does is cause the game to be artificially more difficult than it should be. There is nothing more infuriating in this game than hitting the ball less than an inch out of the designated in-bounds area only for your shot to be disqualified as it is barely out of the zone. At least you are not penalized an extra stroke each time you are out-of-bounds. Regardless, you need putting perfection to clear each hole. a staple of Shin'en's technical prowess. Further damning this otherwise fun! fun! game is that gaining every thing that is to be bought from the in-game store only takes but 3-5 hours of time. That's all. There is also no multiplayer so speak of-- no online, no local, no nothing. Fun! Fun! Minigolf TOUCH! is meant to be a single player experience, and it isn't even a very enticing one at that. Even for the small studio that they are, the fine folks at Shin'en are masters of taking a platform and pushing all the polygons out of it that they can. Their sweat and know-how with Fun! Fun! Minigolf TOUCH! is no exception. The backgrounds are lively and full of interesting geometry, the lighting is very well done, and the game runs at a silky-smooth frame-rate. The music is appropriate for the game-- a light affair-- and the female voice that sports calls of par, birdie, eagle, bogey, and any other golf score you can muster is pleasant and almost soothing. At least Shin'en got the presentation right with their game. Line up your shot and hope it stays in-bounds! Fun! Fun! Minigolf TOUCH! is a game that does not realize its full potential. The lack of any form of multiplayer stings quite a bit, but the small playtime it takes to achieve every task, buy every item in the Shop, and ace every hole and the asinine out-of-bounds rule that makes for an irritating and short-lived experience. As the cheapest 3DSWare game on the eShop service currently, you won't get burned badly if you decide to download this game and dislike it. Perhaps you won't mind the bizarre rules and will have Fun! Fun! 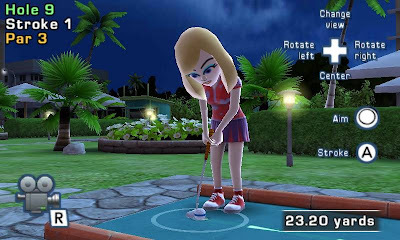 For everyone else, I actually recommend Let's Golf 3D. At least that title reminds me of a good game. The main difference seems to be that out of bounds thing. Doesn't really bug me, though I wonder if that's an actual rule (for official minigolf competitions, perhaps? ), or just for some reason a feature of this game? Either way, I agree with you that it's frustrating, but I didn't mind the game overall. 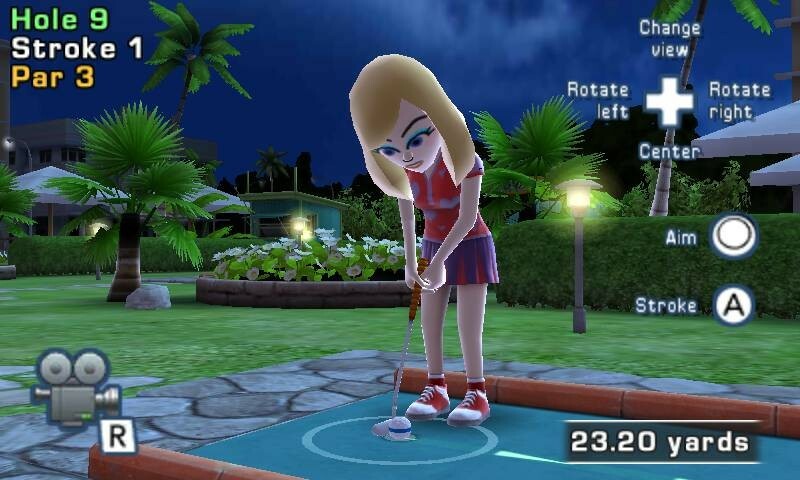 I haven't played Let's Golf 3D, but I did enjoy this game a little. I do agree that its potential is never fully realized and that hurts the game a bit. They should have included more regions, so they would have been forced to include more holes.